Copyright 2009 American Institute of Physics. This article is provided by the author for the reader's personal use only. Any other use requires prior permission of the author and the American Institute of Physics. The following article appeared in Journal of Chemical Physics 130, 124114 (2009) and may be found at http://link.aip.org/link/?JCPSA6/130/124114/1. NOTICE: This is the author�fs version of a work accepted for publication by American Institute of Physics. Changes resulting from the publishing process, including peer review, editing, corrections, structural formatting and other quality control mechanisms, may not be reflected in this document. Changes may have been made to this work since it was submitted for publication. A numerical method to calculate the four-center electron-repulsion integrals for strictly localized pseudo-atomic orbital basis sets has been developed. Compared to the conventional Gaussian expansion method, this method has an advantage in ease of combination with density functional calculations. Additional mathematical derivations are also presented including the analytic derivatives of the integrals with respect to atomic positions and spatial damping of the Coulomb interaction due to the screening effect. In the numerical test for a simple molecule, the convergence up to Hartree in energy is successfully obtained with a feasible cost of computation. In ab initio electronic structure calculations based on the density-functional theory (DFT), the Fock exchange for Kohn-Sham orbitals has been occasionally used as the ``exact'' exchange in order to improve the poor description of exchange energy by the Dirac exchange which is the standard functional used in the local density approximation (LDA) and the generalized gradient corrections (GGA). In recent years, various molecular systems have been calculated by using the hybrid functional methods , such as B3LYP [2,3] and PBE0 , where a certain amount of the Fock exchange is admixed with the LDA/GGA exchange-correlation functionals. The introduction of the non-local Fock exchange significantly improves the delocalization error  in the semi-local LDA/GGA functional and presents better thermochemical and structural properties of molecules. The heavy computational demand to evaluate the Fock exchange is, however, a serious drawback. The studies for large molecules and solids are thus very limited. One solution for this problem is given in the Heyd-Scuseria-Ernzerhof (HSE) hybrid functional  where the long tail of the Coulomb interaction is somewhat artificially damped. The successful application of the HSE hybrid functional to extended systems, typified by the surprisingly accurate values of the band-gap energies of semiconductors , implies that the damping scheme they introduced is not just conducive to reducing the computational cost, but reasonable as well to describe the screening of the Coulomb interaction in real materials. The Fock exchange consists of the four-center electron repulsion integrals (ERI) among basis functions. Since the integration can be performed analytically with the Gaussian-type orbital (GTO) basis functions, the Gaussian-expansion method is conventionally used in the evaluation of ERI where the basis functions are expanded in terms of GTO basis set [8,9,10]. However, the Gauss transform of a numerically defined function might require an indirect way such as a fitting process of the function to analytic functions unlike that for the Slater-type orbital (STO) functions . While, in our method, ERI is evaluated directly from arbitrarily defined basis functions. Specifically in the DFT calculation codes, such as CONQUEST , SIESTA  and OpenMX [13,14,15], the strictly localized pseudo-atomic orbital (PAO) basis sets are commonly used since the real space sparsity of the resultant Hamiltonian and overlap matrices enables us to combine the scheme with various methods and to parallelize the computation by the domain decomposition in real space. Therefore, toward the implementation of the hybrid functionals or any other methods which utilizes the Fock exchange in the DFT calculations, an effective numerical method is required to evaluate the Fock exchange with using the non-analytic PAO basis functions. In this paper, we present a numerical procedure to calculate the four-center ERI for the numerically defined basis functions. We briefly review the mathematical derivations in the next section. Then, based on the formulations, we derive the analytic derivatives of the integrals with respect to atomic positions, which are required for the calculation of the forces on atoms. Our derivation is fully analytic and consistent with the integrals themselves. We also derive the formulation of ERI when the spatial damping of the Coulomb interaction is introduced as in the HSE hybrid functional. Let us summarize how to compute ERI in the present approach: The first step is to transform the radial part of the basis functions by Eq. (15). Then, for every pair of orbitals, -functions are calculated through Eqs. (13) and (14). From those -functions, the overlap coefficients Eq. (17) and the transformed ones Eq. (18) are obtained. Finally, the integral Eq. (9) is calculated by summing up the radial integrals Eq. (10). In the above approach, the spherical Bessel transform (SBT) is performed at three different places, namely, Eqs. (14), (15) and (18). Since the orders of the transforms are different and high at each step, this process can be a source of numerical errors as well as a bottleneck in the computation speed. A careful examination is therefore required in implementing the numerical method of SBT. In the preceding works by Talman, the fast spherical Bessel transform technique is used, which is proposed by Siegman  and Talman . In our experience of testing several numerical techniques, such as the discrete Bessel transform  and the asymptotic expansion method , we have reached the conclusion that the Siegman-Talman's fast SBT method is actually the most stable and fast for the present approach . It, however, still suffers from oscillating numerical error in high-order transforms. The error becomes more significant for the PAO basis functions than the analytic basis functions because of their finite truncation. Fortunately, the oscillating error can be substantially suppressed by applying a simple correction to the fast SBT method as we describe later in this section. where is an arbitrarily chosen parameter and is the Fourier transform. where the integral can be performed analytically . The transform, Eq. (21), is thus reduced to a couple of consecutive one-dimensional Fourier transforms, where we can take advantages of the speed of the fast Fourier transform (FFT) algorithm. As mentioned before, the fast SBT method suffers from the oscillating numerical error in high-order transforms. In Fig. 1, a typical example of such error is shown, where a PAO basis function is transformed with the order and , and then back-transformed with the same order. In the transformed function (the upper middle panel), the oscillating error appears in the small- region. After the back-and-forth transform (the upper right-hand panel), the accumulation of error is observed. Often, the error approaches quickly to infinity and the computation crashes. This rather crude way of correction actually serves for the practical purpose. The lower panels of Fig. 1 show the example of the back-and-forth transform of the PAO basis function with the corrected fast SBT. Here, we use and the straightforward integration are performed only for three selected -points which are , and 0. It is confirmed that the oscillating error is successfully suppressed. Figure 1: Accumulation of numerical error by back-and-forth transforms with the fast SBT method. The input function (a) is a PAO orbital of H atom for and . The transformed function of (a) is plotted in the panel (b), and the back-transformed of (b) in the panel (c). In the lower panels (d), (e) and (f), accumulation of numerical error by back-and-forth transforms with our modified fast SBT method is shown, where the error is substantially suppressed. where and are the spherical coordinate components of the vector . which is a more general one arising from the definition of the integral. It is easily confirmed that the derivatives Eqs. (26), (27), (28) and (29) satisfy the rule. Our motivation is in the application of the Fock exchange in large systems such as large molecules and solids. In those systems, an enormous (infinite for solids) number of combinations of basis functions have to be considered. Fortunately for the PAO basis sets, since they are strictly confined in real space, the overlaps are exactly zero whenever the distance between the basis functions is longer than the sum of the confinement lengths. On the other hand, however, any two overlap functions can interact with each other even if they are separated quite far apart because of the infinitely long tail of the Coulomb interaction. By using the screening scheme described in the previous section, it might be justified to neglect the contribution from the far-separated pairs. Nevertheless, still a large number of pairs have to be calculated since the typical value of the screening parameter is and thus the effective screening length is . Therefore, we should consider to make the computation faster for the final integration Eqs. (9) and (10). As already pointed out by Talman, the convergence of the summation Eq. (9) is very fast so that the cutoff angular momentum and the number of -sampling points can be decreased. We shall define new parameters and for Eqs. (9) and (10) in order to distinguish from the original parameters and which are used in the other parts. Typically, has to be as large as to describe the overlap functions accurately. While, as shown later, is enough to obtain Hartree accuracy in energy even when orbitals are involved. Similarly, is required to be , while, in the final integration, the Gauss-Laguerre quadrature can be used which gives good convergence with . In this case, the required number of -functions is decreased by a factor of the number of orbitals per atom, which is typically . Note that Eq. (46) is not the best choice if just one ERI is considered. In fact, the choice of of with considering the spatial extent of each orbital gives faster convergence in the final integration . Therefore, it becomes a competition between the convergence speed in performing a single integral and the required number of -functions. In order to check the convergence properties of our routine, we first performed calculations of ERI for a GTO basis set. Three different integrals , and are calculated. The definition of the basis functions for the integrals is listed in Table 1. For all the integrals, the orbital locations are fixed to the corners of a square on the plane with edge length of 1; , , and . The cutoff for the angular momentum is and the number of radial mesh points is . In the final integration, the Gauss-Laguerre quadrature is used where the number of k-sampling points is and the summation is taken up to a reduced cutoff . In Table 2, the calculated values of the integrals are shown for increasing , where they are left blank after the convergence up to Hartree is achieved. The exact values are also shown for comparison, which are obtained by using the analysis given in literature . It is clearly found that the convergence becomes slower for orbitals with higher angular momentum. Nevertheless, the accurate values for all the integrals up to Hartree are obtained with . Table: Definition of the integrals in the calculations of ERI for GTO. Table: Convergence of the calculations of ERI for GTO basis set with respect to the cutoff parameter . As a more realistic example, we performed calculations of ERI of a methane molecule for a Slater-type orbital (STO) basis set. The basis functions and the atomic positions are summarized in Table 3. Our results and the comparison values which are calculated by using the Gaussian expansion method  are shown in Table 4. For all the integrals considered, ours and the comparison values agree with each other up to Hartree. The difference from the comparison values is large for and because the C- inner-shell orbital is involved. In general, the small spatial extent of such the inner-shell orbitals makes the convergence slower. This, however, would not have to be considered so seriously in the actual calculations if the contribution of the inner-shell electrons are included in the pseudopotentials. Table: Basis functions and atomic positions in the calculations of methane molecule. The STO basis functions are normalized. Table: Convergence of the calculations of ERI of methane molecule for the STO basis set. The symbols , , , , , and specify the STO basis functions of H and C atoms. See Table 3 for details. The comparison values are taken from ref. . Calculations of ERI for a PAO basis set are performed for the methane structure. The PAO data is taken from those used in OpenMX DFT calculation package . The ground state orbitals generated by the confinement scheme  with the radius of 5.0 Bohr are used as the PAO basis functions for both the hydrogen and carbon atoms. The calculated values are shown in Table 5 where the parameters , and are used. The comparison values are also calculated by using the present method with the enhanced parameters and . As well as the analytic functions such as GTO and STO basis sets, even for the strictly localized PAO basis set, it is confirmed that the convergence up to Hartree is obtained with . Table: Convergence of the calculations of ERI of methane molecule for the PAO basis set. The symbols and the atomic positions are the same as in Table 3. The comparison values are also calculated by using the present method with enhanced parameters (see text for details). The computation time in our method for calculating a single integral is 3.0 sec with Intel Xeon processor 3.2 GHz. This is too expensive compared to the time required in the conventional Gaussian-expansion method, e.g., one of the most sophisticated program takes only 0.5 - 1.3 msec per integral with Intel Pentium IV processor 3.2 GHz . In our method, the most of the time is consumed in the calculation of the overlap functions. Fortunately, the required number of pairs is proportional to the number of the basis functions due to the finite truncation of the PAO basis functions, whereas the effort of the computation of ERIs scales quadratically as the number of the basis functions increases. In addition to that, the overlap functions can be reused for the calculations of ERI with a different pair of them, e.g., the overlap of 1 and 2 for can also be used for etc. Therefore, the computation efficiency in total can be significantly enhanced as the system size becomes larger. In summary, a numerical method to evaluate ERI for the PAO basis sets has been developed. Based on the mathematical analysis by Talman, we derive the analytic derivatives and a spatial damping scheme for the Coulomb interaction. 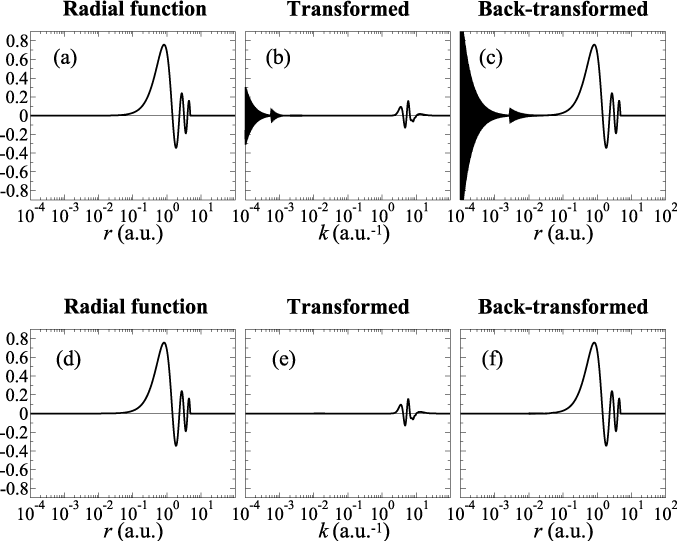 We also propose a numerical method for SBT of the strictly localized PAO basis functions, where the oscillating numerical error is well suppressed even for the high-order transforms. In the numerical calculations for a simple molecule, the convergence up to Hartree in energy has been successfully obtained. The present method enables us to utilize state-of-the-art hybrid functional methods in the DFT calculation programs. This work was partly supported by CREST-JST and the Next Generation Super Computing Project, Nanoscience Program, MEXT, Japan. where the unit vectors are the similar to Eqs. (34), (35) and (36) where and are the spherical coordinate components of . As derived here, all the components are derived analytically, without using any numerical differentiation. where . The same problem may arise for the derivative of terms (A2). However, we do not need to consider the case when is close to zero. This is because, in such case, the two orbitals are located on a same atom and thus the derivative of the overlap function (A1) should be always zero. Here, we assume that all the orbitals are located on the atoms. Note that the derivatives are not taken with respect to the orbital centers but to the atomic positions. A. D. Becke, J. Chem. Phys. 98, 1372 (1993). P. Mori-Sánchez, A. J. Cohen, and W. Yang, Phys. Rev. Lett. 100, 146401 (2008). J. Heyd and G. E. Scuseria, J. Chem. Phys. 121, 1187 (2004). I. Shavitt and M. Karplus, J. Chem. Phys. 36, 550 (1962). H. Taketa, S. Huzinaga, and K. O-ohata, J. Phys. Soc. Jpn 21, 2313 (1966). J. F. Rico, R. López, I. Ema, and G. Ramírez, J. Comp. Chem. 25, 1987 (2004). A. S. Torralba et al., J. Phys. : Cond. Mat. 20, 294206 (2008). J. M. Soler et al., J. Phys. : Cond. Mat. 14, 2745 (2002). T. Ozaki and H. Kino, Phys. Rev. B 69, 195113 (2004). J. D. Talman, Int. J. Quantum Chem. 93, 72 (2003). P.-O. Löwdin, Adv. Phys. 5, 1 (1056). A. E. Siegman, Opt. Lett. 1, 13 (1977). J. D. Talman, J. Comput. Phys. 29, 35 (1978). D. Lemoine, J. Chem. Phys. 101, 3936 (1994). O. A. Sharafeddin, H. F. Bowen, D. J. Kouri, and D. K. Hoffman, J. Comput. Phys. 100, 294 (1992). For example, in the discrete Bessel transform , an interpolation process is necessary because the sampling points vary for transforms of different orders. While, in the asymptotic expansion method , high-order trasnforms are quite unstable due to the factor inversely propotional to the -th order of the variable where is the order of transform. J. D. Talman, Int. J. Quantum Chem. 107, 1578 (2007).